For some who were raised in a family business, the last thing you want to do when you grow up is continue the legacy. For the Ramsden family that is furthest from the truth. 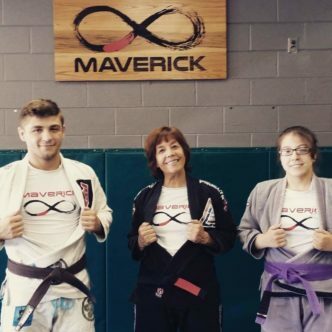 Suzanne Ramsden’s daughter Julia Ramsden and son Evan Ramsden started off as assistant instructors a few years ago and are eager to take on more at the Maverick Training Center in Huntsville, Alabama. The name of her academy comes from Richard Bustillo, her JKD Instructor, who gave Suzanne the nickname Maverick. Suzanne began training martial arts at the age of 40 and her children quickly went along for the ride. She says she started with JKD, than moved on to Muay Thai and than began training Brazilian Jiu Jitsu in 2004. It wasn’t long before Martial Arts became her full time time job. 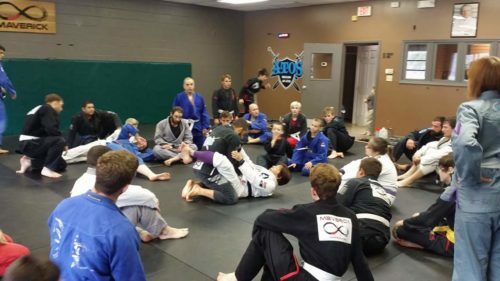 How did you find Brazilian Jiu Jitsu and did you ever have concerns about starting Brazilian Jiu Jitsu? I was exposed to grappling through JKD training, which I started about 40 years old. I never considered my age. I don’t understand “I can’t”. If I’m physically unable to do something that’s one thing. But to not even try is foreign to me. When did you open your own academy? What led you to that decision? I opened my academy in 2005 and taught Muay Thai and JKD. I added BJJ as a club to practice the techniques I was learning from Soneca. It grew from that. I decided to build an ego free, technical academy without politics. As a female running a Jiu Jitsu academy do you think it is more difficult? If so, why? Being a female who is an Academy owner has been challenging. I was a novelty for a long time. I had a small group of guys. I trained hard and often with Soneca. After doing well at tournaments, I was taken more seriously. Yes, it is harder for a woman, unless you have a female only academy. I don’t make an issue about being female. If I’m a good instructor and coach, then being female is irrelevant. I have over 100 students and the majority is male. In a male dominated sport, the way to be taken seriously is to take it seriously yourself. Atos does not make an issue about being female owned academy. Do you run your academy full time? Does anyone else in your family train or teach? If so how did they get involved ? I run my academy full time. My son is a Brown belt and my daughter is a Purple. My son now teaches some of the BJJ classes and my daughter teaches Muay Thai. They are my children, they had no choice!!! How long have your children been training Martial arts? What else do they train? They both have trained Muay Thai. Mydaughter teaches it and still trains it and has even competed in it and won. When I started out in JKD I would show them what I was learning. My daughter has know how to box since she was five years old and my son since he was seven years old. My JKD instructor Richard Bustillo, who recently passed away, also taught them trapping, Muay Thai and Boxing when he would come to town. They didn’t really get into ground training until I started training with Helio Soneca. What has been your biggest obstacle on the mats? How did you overcome it? I started training at 42 years old. I was a single mother with two children. I had to drive 3.5 hours each way to train with Helio Soneca. It was very difficult logistically and financially. I was driven to learn Jiu-Jitsu. I think that life sometimes is like a fight, and I fought for Jiu-Jitsu. What is your greatest joy when it comes to BJJ? My greatest joy is that my children love Jiu-Jitsu too and are working toward their black belts. We share this as a family. Also, through Jiu-Jitsu, I am able to make a living sharing this amazing Art. What would you like your legacy in BJJ to be? My legacy will be my children, my students and my Academy. I work on being a very technical Instructor and motivating Coach. I hope students remember me this way. I am working on a new Foundation for Children. This will be my new focus as my own children take more responsibility in our Academy.